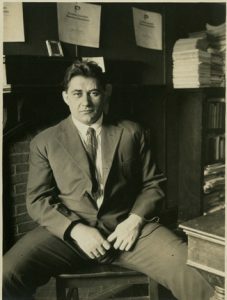 Michael M. Dorizas (1886-1957), a Greek Olympic athlete who was appointed professor after coming to study at the University of Pennsylvania in 1913, was the first Greek to hold such a position. Born in Constantinople, Dorizas competed in the 1908 Olympic games, winning second place in the Javelin competition and doing well in many other events. After his Olympic career ended, Dorizas came to the United States to attend graduate school at the University of Pennsylvania. After completing his Ph.D. in 1924 he took a position as a professor of geography at the university and held the position until his death. The Chestnut Street frontage of the Second Bank of the United States is an example of Greek Revival architecture, a style often adopted for public buildings in the early years of the United States in tribute to Greece's role as birthplace of Western civilization and incubator of democracy. That history also compelled many prominent Philadelphians to support the Greek war for independence. In 2017, the building on Chestnut between Fourth and Fifth Streets housed a historical portrait gallery for Independence National Historical Park. Built in 1821, this Greek Revival style church at 256 S. Eighth Street was not always home to a Greek Orthodox congregation. For one hundred years, St. Andrew’s Episcopal Church held services in the building. 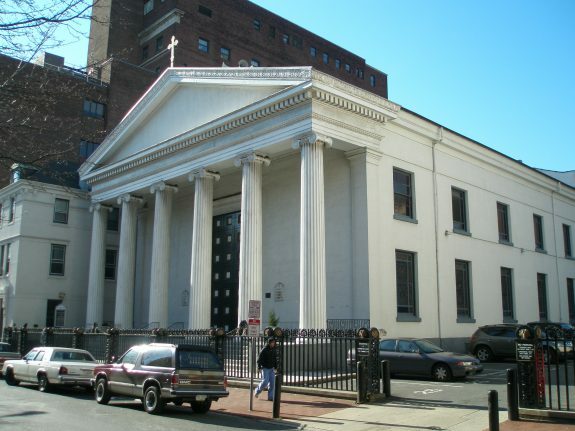 However, as more Greeks immigrated to Philadelphia many settled near the church, which was rededicated in 1921 as St. George’s Greek Orthodox Cathedral. The Cathedral is the mother church of the seven Greek Orthodox communities in the greater Philadelphia area. Over time, St. George’s opened its doors to other Eastern Orthodox worshippers and continued to welcome a large congregation in the twenty-first century. 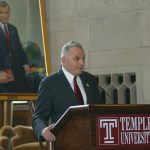 Peter J. Liacouras (1931-2016), the son of Greek immigrants who ran a South Philadelphia grocery store, became the seventh president of Temple University, serving in that position from 1982 to 2000. 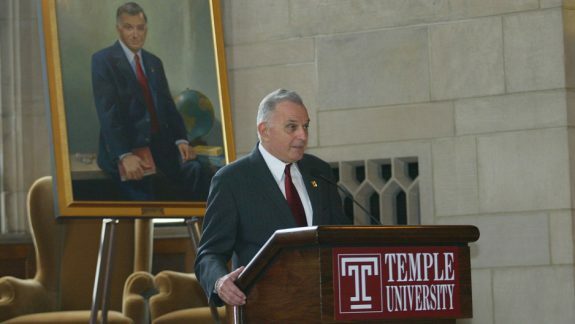 Shown here in 2002 with his own portrait, Liacouras is credited with coining the term “Temple Town” to refer to the University’s expansion in to North Philadelphia. He oversaw the expansion of Temple’s campus to the east and west of Broad Street, which included the addition of student housing and a large indoor arena, built in 1997, renamed the Liacouras Center after his retirement in 2000. During his tenure, Temple became a Carnegie I classification institution, expanded degree offerings, grew enrollment considerably, and expanded its hospital. Despite the school’s growth and success, Liacouras and Temple Town have been criticized for pushing too far in to the surrounding neighborhoods and attempting to insulate the student body from local Philadelphians. Philadelphia’s encounter with Modern Greece dates from the Greek War of Independence in 1821, and thousands of Greek immigrants arrived in the region beginning at the turn of the twentieth century. In the post-World War era, the upward social mobility of the children of the Greek immigrants ensured a continued strong relationship between Philadelphia’s region and Greece and the Greeks. A replica of the ancient Charioteer of Delphi statue, a gift of the Greek government cast in 1977 and placed on the grounds of the Philadelphia Art Museum, marked these ties. 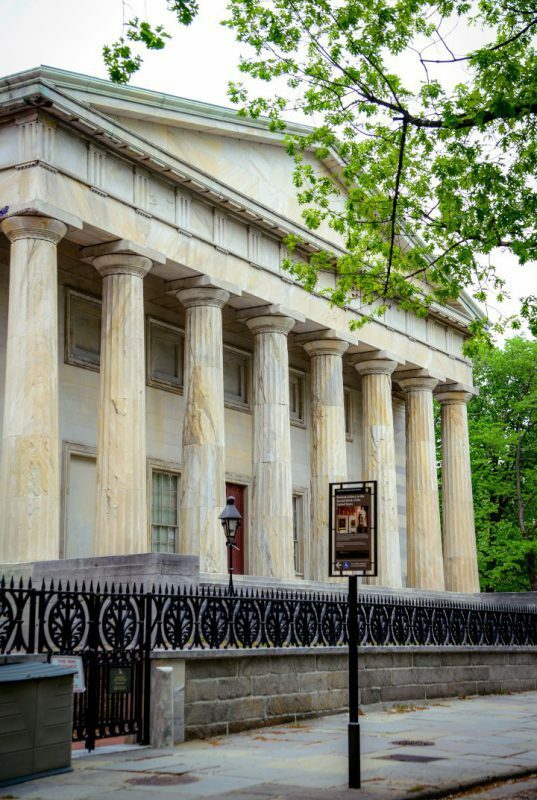 Philadelphia’s close connection to the Greek Classical legacy created an especially close relationship between the city and Greece. Appropriately for a city with a Greek name (phileo meaning love and adelphos meaning brother) and with ties to Classical Greece represented in its architecture and fine arts (inspiring the nickname “Athens of America”), in the nineteenth century Philadelphia became an important venue of American philhellenism, a movement aimed at assisting the Greeks in achieving independence from Ottoman rule. In 1821, an uprising modeled on the liberal principles of the French Revolution began a struggle against the Ottoman Turkish overlords that lasted almost a decade. Americans and Europeans supported and sympathized with the Greek cause, which they viewed as being waged by descendants of the Ancient Greeks, the cornerstone of Western Civilization, and by Christians versus Muslims. Greece’s admirers, known as philhellenes, mobilized public opinion to try and get the U.S. government to take the side of the Greeks. Failing that, they organized committees to gather funds to aid the rebel cause. In Philadelphia, a committee for “the relief of the Greeks and their fellow citizens” formed in 1823. The committee cast its appeals in terms that alluded to the connection between Ancient and Modern Greece but soon found it would be more effective to appeal to the Christian and humanitarian sentiments of middle-class Philadelphians. The region’s strong Quaker tradition of pacifism prevented a number of individuals from supporting measures begun in Boston and New York to aid military operations in Greece. The Philadelphia Greek Committee’s fund-raising activities, which included theater performances and music concerts, came in two phases that corresponded to the surges of the rebel operations in Greece and the hardships of the civilian population. By May 1827 the fund had reached $23,000, and the committee sponsored two ships to carry supplies to the Greeks. Within a year, the European powers rewarded the Greeks with diplomatic recognition, paving the way for the establishment of an independent Greece. Support for Greece echoed in 1897 when the Philadelphia Inquirer gave front-page coverage to the Greek-Turkish War. However, further encounters between the city and Greece were mediated by Greeks who began arriving at the turn of the twentieth century. The first of two waves of immigrants from Greece to the region came between the 1890s and the 1920s. During that period, about 400,000 Greeks entered the United States but only a few thousand settled in Greater Philadelphia because the city’s most attractive employment opportunities in sectors such as small manufacturing and printing required a knowledge of English, which they lacked, and because most manual labor jobs they might have filled had been taken by earlier-arriving Italians. Brothers Constantine (1865-1944) and Stephen (1869-1956) Stephano arrived in the Philadelphia in this era and established the important Greek-owned cigarette manufacturing firm Stephano Bros., which began in a basement in Center City Philadelphia and eventually acquired its own building at 1014 Walnut Street. The company grew into one of the largest producers of Turkish and Egyptian tobacco cigarettes in the United States and at one point employed almost five hundred workers. By the 1920s the Stephanos had become a prominent Philadelphia family and contributed generously to community organizations, campaigns to support the homeland, and to the building of the first Greek Orthodox Church in Philadelphia. 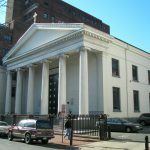 In 1901, the Stephanos presided over the establishment of the Greek Orthodox Community of Philadelphia, which in 1908 purchased All Saints Episcopal Church at 745 S. Twelfth Street and converted it into an Orthodox Church renamed Evangelismos (Annunciation). Located in a part of the city which already had a few Greek families and businesses, Evangelismos Church attracted more Greeks who formed a small “Greektown” that spread across roughly six blocks centered on Locust and Tenth Streets. In addition to Evangelismos, the community grew to include St. George, established in 1921 and designated as the region’s Greek Orthodox Cathedral in the 1930s. St. George’s building at 256 S. Eighth Street, originally St. Andrew’s Episcopal Church, was designed by architect John Haviland (1792-1852) with inspiration from the ancient Greek temple of Dionysus. The neighborhood around the two churches also included Greek-owned businesses, diners, a Greek senior citizen housing development, and a travel agency that specialized in travel to Greece and Cyprus. Emigration from Greece effectively halted in the mid-1920s, when the United States limited entry to quotas based on numbers of immigrants from each country in 1890, which was just before Greek transatlantic migration began. Nevertheless, by the mid-twentieth century, more than fifteen thousand first- and second-generation Greek Americans lived in the Greater Philadelphia area. Community life revolved around seven Greek Orthodox churches: Evangelismos; three named after St. George in Philadelphia, Trenton, New Jersey, and Media, Pennsylvania; St. Demetrios in West Philadelphia; Holy Trinity Church in Wilmington, Delaware; and St. Nicholas in Atlantic City, New Jersey. There were also numerous fraternities of Greeks who originated from the same region or island in the homeland, such as Chios, Cyprus, Epirus, Ikaria, Macedonia, Peloponnesos and the Pontus (Black Sea) region. Greek-American professionals formed the Hellenic Medical Society of Philadelphia, local chapters of the American Hellenic Educational Association, and a society of those who had obtained university degrees, the Hellenic University Club of Philadelphia, which began in 1936 to pursue cultural and social activities and later raised money for scholarships for young Greek Americans. The need to coordinate the growing number of organizations led to the creation of the Federation of Hellenic American Societies of Philadelphia and the Greater Delaware Valley in 1949. Philadelphia’s status as a significant Greek center in the United States was affirmed in 1942, when the city hosted the eighth Clergy-Laity Congress of the Greek Orthodox Archdiocese of North and South America, attended by Greek King George II (1880-1947) and Prime Minister Emmanuel Tsouderos (1882-1956). Previous venues included cities with a significant Greek presence such as Chicago, Detroit, and New York. Another sign of the growing community of Greeks in the Greater Philadelphia came in the early 1950s, when the Federation of Hellenic American Societies of Philadelphia and the Greater Delaware Valley began the tradition of an annual Greek parade in Center City to commemorate the 1821 uprising that led to national independence. The Immigration and Nationality Act of 1965 relaxed the restriction that had stemmed immigration from Greece in the 1920s and brought a new wave of arrivals to the Philadelphia area. By the time this influx subsided in the late 1970s, the numbers of Greeks or persons of Greek descent in the region had more than doubled to about thirty-five thousand. The new wave of Greek immigrants largely settled in a new “Greektown” —much bigger than the one in Center City—that emerged west of Philadelphia in the Township of Upper Darby, Delaware County, after World War II. A steady trickle of Greeks from Center City and West Philadelphia to Upper Darby grew during the 1950s and prompted St. Demetrios Church to move from West Philadelphia to Upper Darby in the early 1960s. But it was the settlement of post-1965 immigrants that created a Greek enclave that included businesses, white-collar professionals advertising their services in Greek, stores with Greek food products such as cheeses, herbs and spices, olive oil, Greek coffee shops, Greek-language radio stations, and a newspaper, the Hellenic News of America. In 1991, the newspaper began sponsoring an annual Greek and U.S. trade fair, “Hermes Expo.” The fair coincided with a significant growth in trade relations between Greece and the United States. Greek products exported to the United States have included food and agricultural products, tobacco, razors, petroleum products and by-products, cement, clothing and apparel, fur articles, marble, steel products and pipes. U.S. exports to Greece have consisted mainly of telecommunications equipment, electrical equipment, computers and electronic equipment, medical and pharmaceutical items, machinery and parts, timber and wood-pulp, and agricultural products. Upper Darby’s “Greektown,” which numbered roughly five thousand Greeks in its heyday, lasted just over two decades until upward social mobility led most of the Greeks farther west to suburban townships in Delaware and Chester Counties, a trend marked by the creation of St. Luke’s church in Broomall, Pennsylvania. The drift of the Greeks to these and other suburbs led to the formation of three more churches, St. Thomas in Cherry Hill, New Jersey; St. Anthony in Vineland, New Jersey; and St. Sophia in Valley Forge, Pennsylvania. The Greek newspaper also moved its offices from Upper Darby farther west in Delaware County to Concordville, Pennsylvania. Nevertheless, Upper Darby remained a point of reference for Greek Americans of the region. A web-based local Greek news organization (Cosmophilly.com, established in 2012) made its headquarters there, and St. Dimitrios church continued to host the very popular Philadelphia Greek Basketball League (established in 2007). From the 1970s onward, Greeks maintained a strong presence in the region’s food industry. Many immigrants turned to this sector because it required a minimal knowledge of English, it was a good fit with the gregarious and sociable nature of many Greeks, and because some Greek-owned diners already existed, making this an easy way to gain employment and a foothold in the business. As was the case elsewhere in the United States, many Greeks owned diners in the Greater Philadelphia area. A large number of Greeks also ran coffee shops, pizza restaurants, and sandwich shops. Many post-World War II immigrants and their children also became white-collar professionals. The Greeks made their presence felt in the Greater Philadelphia area even though their numbers were relatively small compared to other European ethnic groups. By the early twenty-first century the thirty thousand Greeks in the Greater Philadelphia could be found in a wide range of professions, from white-collar professionals to small-business people operating restaurants and pizza shops. Ethnic associations, Greek Orthodox churches, and events such as the Greek parade and church-based Greek food fairs anchored community life. Although emigration from Greece decreased significantly after the mid-1970s, the creation of the Greek American Heritage Society of Philadelphia in 2002 was emblematic of an American ethnic group continuing to honor and preserve its immigrant past. Alexander Kitroeff is an Associate Professor of History at Haverford College. His research and publications focus on the history of the Greek diaspora. Cohn, Roger. “Greektown: Still Hanging On.” Philadelphia Inquirer, February 23, 1986, 1B, 6B. Kitroeff, Alexander. “The Girl’s Hood: Upper Darby’s Greektown.” Odyssey Magazine (March-April 2011). Kourelis, Kostis. 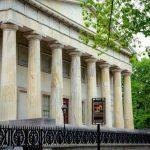 “From Greek Revival to Greek America: Archaeology and Transformation in Saint George Orthodox Cathedral of Philadelphia.” In The Archaeology of Xenitia: Greek Immigration and Material Culture, ed. Kostis Kourelis. Athens: New Griffon, 2008. Pearse, Sandy. “15,000 Greeks Here Preserve Hellenic Tradition.” Philadelphia Inquirer Magazine, October 14, 1954, 8-9. Repousis, Angelo. “The Cause of the Greeks: Philadelphia and the Greek War for Independence, 1821-1828.” The Pennsylvania Magazine of History and Biography Vol. 123, No. 4 (October 1999): 333-36. 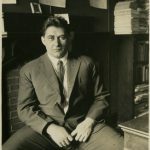 Michael M. Dorizas Papers and Gregory G. Lagakos Papers, Historical Society of Pennsylvania, 1300 Locust Street, Philadelphia. Charioteer Statue, Philadelphia Museum of Art grounds (northeast corner), 2600 Benjamin Franklin Parkway, Philadelphia. Pontian Society “Akritai” of Philadelphia, 6456 Market Street, Upper Darby, Pa.
St. George Greek Orthodox Cathedral, 256 S. Eighth Street, Philadelphia.